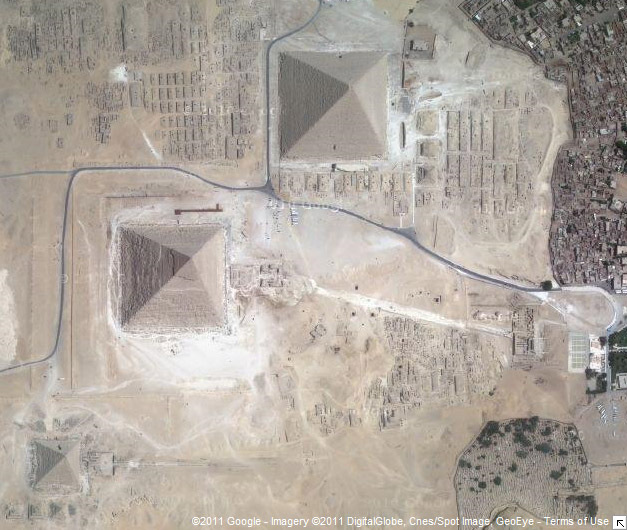 Why not start with one of the most famous ancient sites: the Pyramid Complex of Giza. The “site” includes several monuments which trace the conceptual evolution of a divine shape now universally recognized as a pyramid but more importantly a visual record of engineering trial and error. Chronologically, the first innovation can be seen in Djoser’s stacked mastabas or the Step Pyramid in Saqqara. Previously, pharaohs were buried under large rectangular brick structures until architect, priest and generally creative guy Imhotep though stone would be better and that six progressively small mastabas would be an even better way to exalt the king. 30 years later, King Sneferu was determined to smooth the form a 17 miles south in Dashur. I would imagine that the visual correlation of ascending to Ra the Sun God made for a strong theological rationale for the pyramid shape. Sneferu’s reign created the so called Bent Pyramid which rises gradually then changes to a shallow angle of ascent about halfway up. Presumably there was a problem baring the weight of the building and a more conservative angle was needed to complete it. I can’t fault the builders at all for this awkward looking pyramid; these were constructed with only the most basic tools, fundamental building technology and the brute force of thousands. Sneferu was finally successful and completed the Red Pyramid next door. Finally, the pyramid everyone remembers is that of Sneferu’s son Khufu (2589-66BC) – The Great Pyramid. Just outside the Cairo, it is constructed from 15 ton stone blocks and surrounded by temple complexes, minor pyramids to Queens, the Sphinx, and an impressive solar boat reconstructed painstakingly from over a thousand pieces. Set behind Khufu’s pyramid is that of Khafre and Menkaure which get progressively smaller in size. After this, kings no longer chose to construct pyramids which puts this incredible boom and bust of Old Kindom funerary building in only a ~164 year window. While you can’t climb the pyramids like you use to do hundreds of years ago, it is still impressive sight and high on my To Do list! Getting there: Once in Cairo, taxi tours to Giza, Saqqara and Dashur can be arranged with most hotels. It generally good advice to arrange the price ahead of time, find a driver who speaks English, and work out how long you want to tour around. It’s very possible to see all three sites in one day. Myself, if I’m going to Egypt it’s going to be for a while and I’m going to see more than just the Pyramids. I’ve got my eyes on Gap Adventure’s Egyptian Archaeology Adventure and will tack on a few days in Alexandria. ← UNESCO World Heritage Sites!